This land - where the beautiful AuSable River flows into Lake Huron - is alive with the shadows and echoes of those who have passed this way before us. We who follow can but watch and listen. And remember. 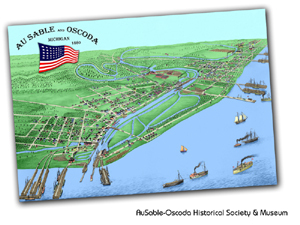 Museum Exhibits Include: Indian artifacts, commercial fishing, shipping, ship wrecks, logging, Paul Bunyan legend, railroads, lighthouses, the AuSable River and its dams, the fire of 1911, Wurtsmith Air Force Base, and more! Gift Shop Features: Books on local history, 1880 birds eye map, history video, photos, mugs, shirts, gifts, coloring book, various old time & musical toys, and more!